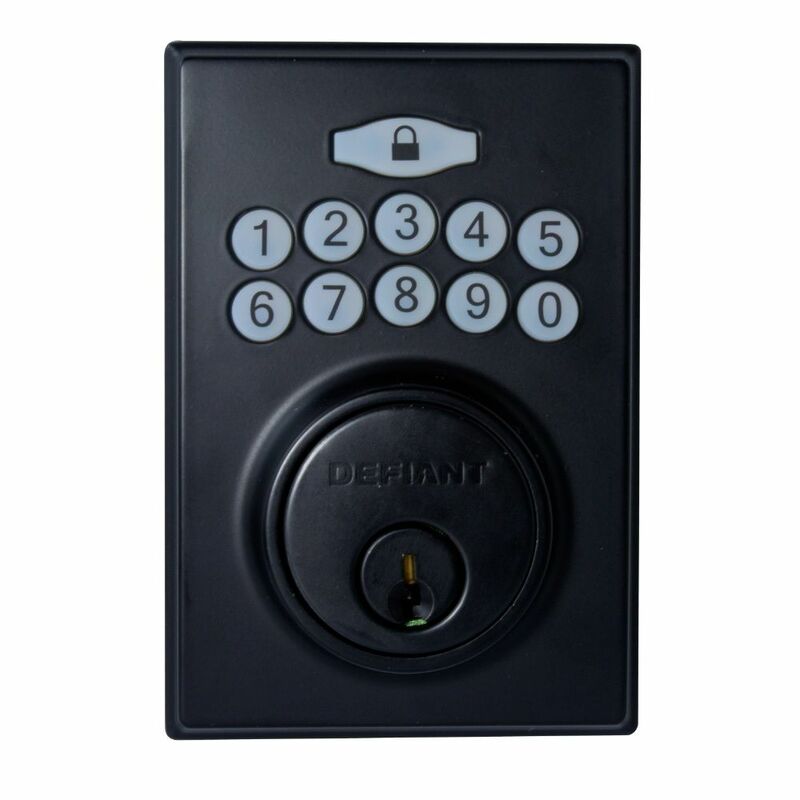 Featuring a Lifetime Guarantee, the Defiant Matte Black Square Electronic Keypad Deadbolt meets or exceeds ANSI Grade 3 Standards for residential use. Defiant keyless entry technology brings peace of mind wihtout the worry of losing keys. This lock features a drive in latch with an adjustable backset and optional radius cut faceplate . Locks can be re-keyed to fit your existing KW1 keyway. The powder coated finish will provide years of durability. When used as a replacement lock, only a screwdriver is needed, making installation a snap. Adding security for your family and property with a reliable Defiant brand keyless entry technology brings you peace of mind and removes the worry of losing keys. User-friendly features offer ease of installation, operation and customizable programming, and are all supported by impeccable service backed by a lifetime warranty. New Honeywell Digital Dead Bolt. Installs in minutes on any door and only requires a standard screwdrive. Digital buttons light up for ease of use anytime of the day! Holds up to 50 different user codes and is equipped with a "failed attempt" alarm and LED warning Flashes to ensure all intruders are unsuccessful! Automatic 1 touch locking so add to ease of use and safety! Comes with 2 back up entry keys, all mounting hardware and strike plates and operating manual. All mechanisms and beautiful Antique Brass Finish has a Life time Guarantee! New Honeywell Digital Dead Bolt. Installs in minutes on any door and only requires a standard screwdrive. Digital buttons light up for ease of use anytime of the day! Holds up to 50 different user codes and is equipped with a "failed attempt" alarm and LED warning Flashes to ensure all intruders are unsuccessful! Automatic 1 touch locking so add to ease of use and safety! Comes with 2 back up entry keys, all mounting hardware and strike plates and operating manual. All mechanisms and beautiful Oil Rubbed Bronze Finish has a Life time Guarantee! The SK703 keyed deadbolt for storm and screen doors complements the appearance of the DX Series pull and push-button handles while adding additional security to your home.FUNCTIONALITYA keyed deadbolt allows you keep your main door open and enjoy the light that comes in through a storm door while still feeling secure. The SK703 is not a high security lock, but a secondary level of security. The key allows you to lock your storm door as you leave the home, and unlock it if someone inside has locked the door. INSTALLATION Installation is easy and should take about 20 minutes. Only three small 5/16&quot; holes are required to be drilled through the door for the screws and spindle (many of our competitors' locks require larger 7/8" holes). Only a tape measure, drill and screw driver are required. A center punch to mark the holes is handy, but not required. The set includes screws for doors 1&rdquo; to 2-1/8&rdquo; thick. The spindle can be cut to the length required. The SK703 is designed for out-swinging storm doors. You may be able to use it on an in-swinging storm door, but we can&#39;t provide instructions for doing so and you may need to get creative. MORE If you have a lever-style handle set, you may want to consider our GL Series deadbolt (model # SKGLK). The set is manufactured from die cast zinc and painted or coated to match the colour of the handles. Ideal Security has been supplying quality storm and screen door hardware to door manufacturers for over 50 years. Square KW1 Cylinder Keyless Entry Electronic Keypad Deadbolt in Matte Black Featuring a Lifetime Guarantee, the Defiant Matte Black Square Electronic Keypad Deadbolt meets or exceeds ANSI Grade 3 Standards for residential use. Defiant keyless entry technology brings peace of mind wihtout the worry of losing keys. This lock features a drive in latch with an adjustable backset and optional radius cut faceplate . Locks can be re-keyed to fit your existing KW1 keyway. The powder coated finish will provide years of durability. When used as a replacement lock, only a screwdriver is needed, making installation a snap. Square KW1 Cylinder Keyless Entry Electronic Keypad Deadbolt in Matte Black is rated 5.0 out of 5 by 3. Rated 5 out of 5 by happy gal from Great Lock! I bought this a month ago and I'm so glad I did. It was easy to install. Works like a charm! Rated 5 out of 5 by Rickw from Great value Got this on black Friday and if you are looking for a basic electronic lock its fantastic. Easy to install, easy to program, and easy to operate. Quality seems decent. does lock have the option to auto lock after a period of time? Yes. This unit can auto lock with a time delay form 10-99 seconds. Thank you for your question.